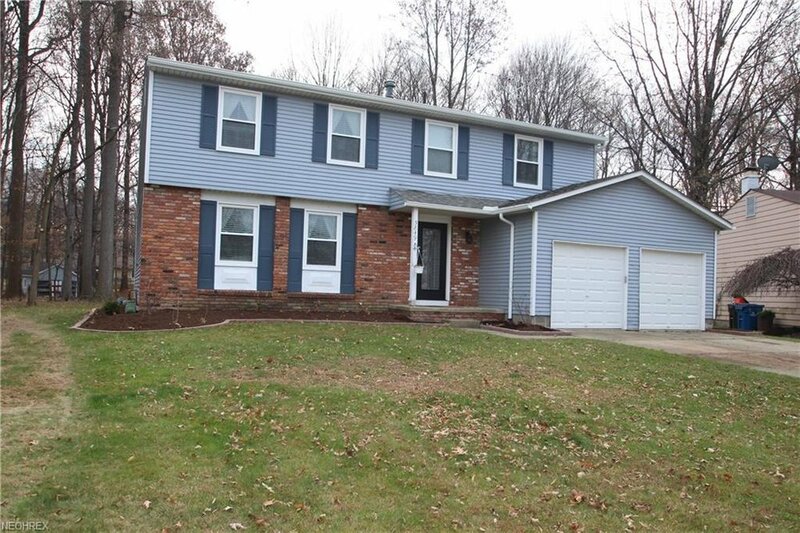 This Colonial Style Home boasts 5 bedrooms and sits on a large lot in Mentor on-the-Lake. Upon entry, you are greeted with a spacious foyer. The formal living room gives plenty of space for furniture and is only one of the three living spaces this home has. The family room opens to the kitchen and feels like an open concept floor plan. All of the flooring has been updated throughout the home. The kitchen has newer cabinets, hardware, Corian countertops and a nice size eating area. Host a dinner party in the formal dining room. The master bedroom has an en suite with updated bathroom complete with walk-in, tiled shower. Additionally there are four other nicely sized bedrooms upstairs with larger closets and windows. Central to the bedrooms is a large bathroom with new vanity, tub and floor. The lower level has a large finished recreation room with newer carpet, molding and paint as well as additional storage/ workspace. Enjoy entertaining guests outside on the concrete patio while guests swim in the pool or visit in the backyard. All interior doors are new. The beautiful front exterior door is brand new. Gutters were replaced in October 2017. HVAC is 6 years old and the roof is approx 8yrs. Truly a nice home!